Want to quit Facebook but don't have the willpower? Maybe very publicly announcing you are signing off for a couple months will do the trick. 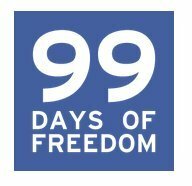 To help you do so, a Dutch ad agency named Just is starting a campaign called "99 Days of Freedom, asking you to quit Facebook for 99 days and measure whether or not it makes you happier. Then you just agree not to go on Facebook for 99 days. It's just a pledge: The 99 Days website has no way of keeping track of whether or not you visit Facebook. Odds are you will still check it every time you're in the bathroom. You can also sign up to participate in the project's happiness survey, letting the people in charge know if you're feeling any better without Facebook. The ad agency seems to be capitalizing on Facebook's controversial mood experiment. Scientists at Facebook published a paper at the end of June in which they revealed that they had played with almost 700,000 Facebook users' News Feeds to see if they could alter peoples' moods. The study caused enough outrage that the company's chief operating officer, Sheryl Sandberg, commented on it in a recent interview. Sandberg called the experiment "poorly communicated," but did not apologize.